Kayla is my little treasure. She is five months old in this picture. I love looking at baby photos of Kayla. I know children grow everyday, but it truly amazes me to experience all the changes they go through. 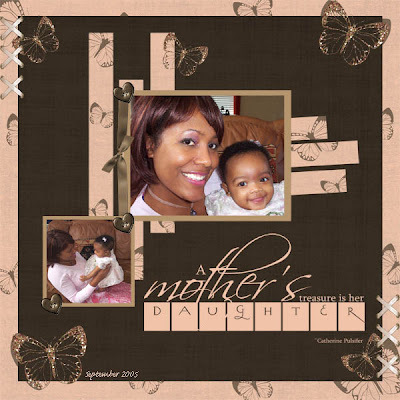 I used Sweet Kay by Steel City Scraps to create my layout. This is so precious...and I have that WA!!!! You've given me some great ideas. I've been collecting mother/daughter WA to go back and do some of Kaitlyn's baby pics! I love this layout!